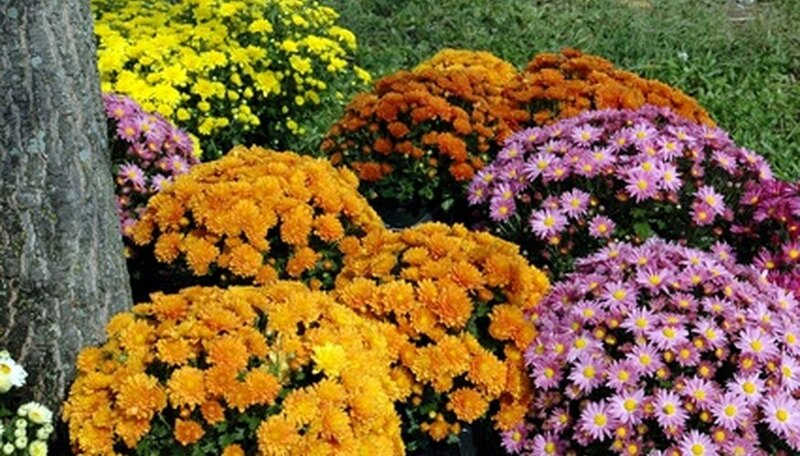 Garden mums (Chrysanthemums) are one of the most widely planted and beloved of perennial growing flowers. They come in a wide assortment of sizes (from the 5- to 6-inch-wide giant football mum to the pompom variety that has tiny 1-inch-wide flowers) and colors, including bronze, white, red, yellow, pink, purple and green. Whichever variety of garden mum you wish to grow in containers, make sure you provide them with lots of sunshine and plenty of water. Choose suitably sized planting pots for the garden mums. Garden mums can grow to as tall as 2 to 3 feet, so depending on the variety of garden mums you are growing, use at least 10- to 12-inch-wide planting pots. Pour 10 cups of water into a basin or large bucket. Add in 1 cup of bleach. Place the planting pots into the water and bleach solution to sterilize the planting pots. Let the pot soak in the solution for approximately 1/2 hour. If you are using clay pots, clean the clay pots thoroughly using hot water and soap. Then place the pots upside down to air dry overnight. Place a small piece of broken clay pot or a small rock near the drain hole in each of the planting pots (to help facilitate drainage). Do this only if you are using clay planting pots that have only one drain hole. Sterilize the growing media if the potting mix you are using is soil-based and has not been pre-sterlized. Spread the soil onto a cookie sheet or into a large bowl. Set the oven temperature to 160 degrees F and steam the mixture for 30 minutes, as suggested by Syngenta Flowers. Or make your own potting soil by mixing together equal parts of loam, peat moss and fine sand. Sterilize the mixture as directed above. Fill up the planting pots with the growing media until they are approximately 1/2 full. Pack the soil down firmly in each of the planting pots. Remove the mums from their current growing containers. Flip the planting pots upside down. Place your hand on top of the root ball. Tap upward on the rim of the container using a trowel. Then slide the container off the root system of the garden mum. Place the garden mum into a planting pot. Check to ensure you are planting the garden mum at the same level in the planting pot as it was previously growing. Hold the garden mum vertical while you scoop soil in and around the root system to fill the planting pot full with soil. Tamp the soil down in the planting pots to eliminate any air pockets. Set the pots of garden mums in a sun-filled location in your garden. Immediately after transferring the pots, water each of the garden mums thoroughly using approximately 1 gallon of water per garden mum. Then, plan on watering the potted mums 2 to 3 times a week. Provide 1 to 2 gallons each time you water to moisten the growing media down to a depth of 4 to 6 inches. The best time to plant garden mums in containers is in early spring: late February through March. Fertilize starting at 2 weeks after planting up until the flower buds appear in late July. Use a 6-2-4 or 4-2-3 liquid or granular fertilizer. Make sure to read the instructions the manufacturer provides on the products label so you will know how many teaspoons, or tablespoons to use.